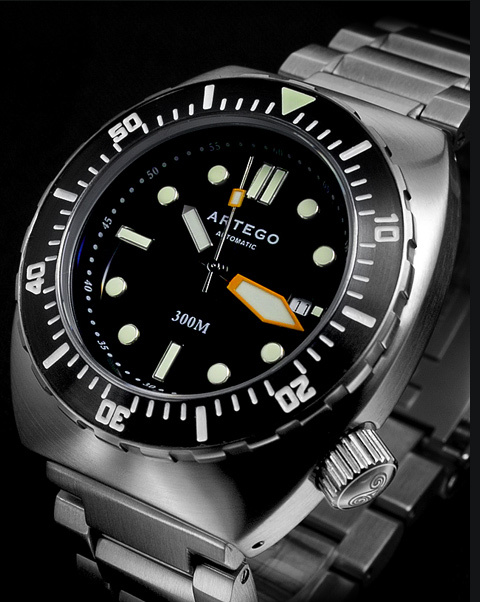 Spotted on OceanicTime, the Web’s reference blog for forum diving watches, here comes a new diving watch company called Artego. Inspired by the 1970 timepieces, their flagship collection Artego Diver comes with a rugged and reliable automatic Miyota 8215. The case is 45 mm in width for 15.5 mm in thickness and features a sapphire crystal with anti-reflection coating on the inside. The case is available in stainless steel with full steel bezel or bezel with aluminium insert. The dial is available in black, orange or an unusual turqoise blue. Each model is available with brushed or blasted surface finish. The aluminium bezel insert is also available on a black PDV version. All watches come with the Artego stainless steel bracelet with diving buckle. It’s a well done watch, I was quite pleased with it. I like the various options available as far as dial and bezel colors. Makes it easy to find one that fits your taste! For those interested, here’s my review of the Artego. Artego is the only brand I buy for a watch. Great style and quality. Absolutely gorgeous and serious watch. It is a tank. I love that it houses a decent Miyota movement that’s simple, reliable, and can be found easily in the future for a replacement when necessary. A beater, and can take it. Wow, this reminded me of the early Japanese diver models. Great style, do you know any website that sells this?